UNIVERSITY PARK — Mike Gesicki said he ended up “exactly where I belong” after getting selected by the Miami Dolphins in the second round of the NFL draft Friday night. “It’s one of the most exciting moments of my life,” Gesicki told Miami reporters after he was selected to play for the Florida team. Gesicki enjoyed arguably the best college career ever by a Penn State tight end, setting program records for receptions (129), yards (1,481) and touchdowns (15) at the position. A superb all-around athlete, the 6-foot-6, 247-pounder impressed NFL scouts with his physical skills and was rated as one of the top tight ends available in the draft. The Dolphins took Gesicki with the 42nd overall pick, making him the second tight end drafted, the first being South Carolina’s Hayden Hurst at No. 25 in the first round. “They made it seem like I was home a couple of weeks ago,” Gesicki said, referring to a pre-draft visit with the Dolphins. “That organization has a lot of great history,” he added. 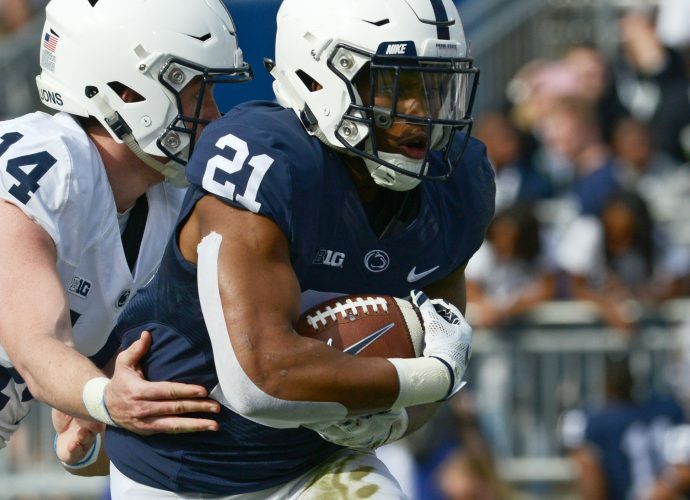 Gesicki was the only Penn State player drafted Friday, leaving third-round hopefuls such as receiver DaeSean Hamilton and safety Marcus Allen having to wait another day to hear their name called. Gesicki figures to have an opportunity to play early with the Dolphins, who are thin at tight end. There are concerns with Gesicki’s blocking skills, which the ESPN announcers made clear when his name was called Friday. One announcer even called him a “one-trick pony,” before adding that he’s very good at that trick — catching passes. Gesicki had several well-publicized drops early in his career, but he overcame that adversity and went on to enjoy an outstanding career with the Nittany Lions. “Mike took the adversity he had early in his career and used it as fuel to become one of the top tight ends in Penn State history,” coach James Franklin said in a university statement. “He is an athletic freak and showed that with his performance at the NFL combine. PITTSBURGH (AP) — Oklahoma State’s electric duo of James Washington and Mason Rudolph are taking their air show to Pittsburgh. The AFC North champions selected Washington — the second-leading receiver in Big 12 history — in the second round of the NFL draft on Friday and grabbed Rudolph — who threw for 92 touchdowns in four years with the Cowboys — early in the third. The two put on a show during their time with the Cowboys. Rudolph went 32-9 as a starter with Oklahoma State while Washington set a school record with 4,472 yards receiving. They’re already familiar with Heinz Field. Rudolph passed for 497 yards and five touchdowns, including five passes for 124 yards to Washington, as the Cowboys rolled Pittsburgh 59-21 last September. Now Washington and Rudolph will continue their partnership while learning behind Steeler stars Ben Roethlisberger and Antonio Brown. “I had no clue this was in the works,” Rudolph said. Offensive coordinator Randy Fichtner downplayed the idea that Rudolph will serve as Roethlisberger’s eventual heir, though Rudolph is the first quarterback the Steelers have taken before the fourth round since they drafted Roethlisberger 11th overall in 2004. Fichtner said he hopes the 36-year-old Roethlisberger plays for another handful of seasons. Rudolph joins a quarterback room that includes Roethlisberger, Landry Jones and Josh Dobbs. Rudolph set 54 school records during his time at Oklahoma State and at 6-foot-5, 235-pounds is similar to Roethlisberger in terms of size. Whether Rudolph ends up checking all the other boxes, however, is up to him. That’s fine by the 22-year-old Rudolph, who admits he’s not sure why he slipped to the third round behind the group of five quarterbacks that went in the first. The Steelers selected him with the 60th overall selection, immediately filling the void created when Pittsburgh dealt talented but enigmatic Martavis Bryant to Oakland on Thursday. Though the 5-foot-11 Washington lacks Bryant’s size and 4.3 speed, he compensates with a competitiveness that made him productive wherever he lined up in the wide-open offense Rudolph ran so adeptly. Regardless of what the stopwatch says — he ran a so-so 4.54 40-yard dash — Washington proved he can get deep. He averaged 19.8 yards per reception with the Cowboys and showed the kind of elusiveness that allowed him to turn a short pass into a sprint to the end zone. As 213 pounds, Washington also has the strength to be an effective blocker in the run game and brings a kind of physicality the Steelers have long valued in their receiving group. “This guy comes in with several tricks,” new offensive coordinator Randy Fichtner said. Fichtner called Washington “no maintenance,” which would be a departure from Bryant, who was twice suspended for violating the league’s substance abuse policy and was briefly benched last fall after demanding a trade. This is the second straight year the Steelers have taken a wide receiver in the second round. They selected JuJu Smith-Schuster in the second round of the 2017 draft. Smith-Schuster’s rapid development made the talented but enigmatic Bryant expendable. Washington labeled himself a big fan of Brown and Smith-Schuster. It’s the same for Rudolph. Though he prides himself on his competitiveness, he understands the starting gig is Roethlisberger’s until Roethlisberger decides he doesn’t want it anymore.